The third person of the Holy Trinity, who is distinct from the Father and the Son but one in being, coequal, and coeternal with them, because, like them, he is in the fullest sense God. He is also called the Spirit of Truth, the Creator Spirit, the Sanctifier, as the gifts of revelation, of creation (and re-creation), and of sanctification are the outpourings of God's love, and therefore appropriated to the Spirit of Love, though whatever God does outside the Trinity (in the world of creatures) belongs to the common or united action of the three divine persons. 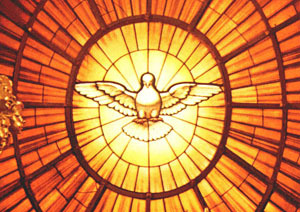 Holy Spirit is usually represented artistically as a Dove, because it was in this form that he descended visibly upon Christ in the Jordan (Mark 1:10). God is only One, but He has revealed Himself very distinctly as three persons, so that we mere creatures can come to a better understanding of Him, however we are unworthy to know God completely and He remains the greatest mystery of our faith. The Holy Spirit is a fire of Divine Love that comes to touch us and refine us in an ardent desire to possess God. It gives us a passion for God, it destroys all the earthly affections because it opens our spiritual eyes to see how precious God is. God saw our need to have His Holy Spirit, otherwise we would be doomed. For this reason He made a promise in the Old Testament which was fulfilled with the coming of Christ, He spoke through different prophets. We are temples of the Holy Spirit and to be filled with the Spirit of God we must cleanse our temples with the waters of repentance through baptism. However we are supposed to stop sinning in order to receive the fire of the Holy Spirit. So this promise of God is conditional to our repentance. Have you ever seen the Holy Spirit? (No, that's not a trick question.) Seriously, then: have you seen the Spirit? No, of course not. The best we get in the Bible are descriptions of tongues of flame (Acts 2) or a freely blowing breeze (John 3). I think that's what makes preaching on – or for that matter even talking about – the Holy Spirit so difficult. We don't know what the Spirit looks like. The Bible contains five major lists of gifts given by the Holy Spirit. All the gifts of Holy Spirit given in both books of the Bible are compiled in this article. I invite your attention to this passage (John 14:16-17) because we shall find in it some instruction on four points: first, concerning the true and proper personality of the Holy Ghost; secondly, concerning the united agency of the glorious Three Persons in the work of our salvation; thirdly we shall find something to establish the doctrine of the indwelling of the Holy Ghost in the souls of all believers; and fourthly, we shall find out the reason why the carnal mind rejects the Holy Ghost. Many things have ye spoken against me. These things I forgive you on your repentance, and exact no penalty of you; but blasphemy against the Spirit shall not be forgiven, no, not to those who repent. And how can this be right? For even this was forgiven upon repentance. Many at least of those who said these words believed afterward, and all was forgiven them. The sins against the Holy Ghost are commonly said to be six in number: despair, presumption, impenitence, obstinacy, resisting truth, and envy of another's spiritual welfare. Some of these are less difficult of pardon than others. Final impenitence is absolutely unpardonable. Those, too, who from deliberate malice refuse to recognize the work of God, as the Pharisees did when they saw the miracles of Our Lord and attributed them to Beelzebub, the Prince of Devils are unpardonable. In reflecting at length why certain sins against holy spirit are unforgiveable, several things have come to mind regarding each one of the 6 sins: despair, presumption, impenitence, obstinacy, resisting truth, and envy of another's spiritual welfare. They all have one thing in common: We judge ourselves, taking the supreme authority from God. When we commit one of these grievous sins, we refuse God's love and forgiveness. These sins are all made by our own choosing to commit them. They are all intentional. What is the relevance of Pentecost in our Church? When we think about Holy Spirit the two factors which rush to our mind are Love (agape) and Cooperation (Selfless Unity with identity intact). Both these things are found in perfection in the Holy Trinity. Holy Trinity is the model and source of encouragement for humanity in the contemporary world. We should derive energy to grow in spirit from that divine source. Few holidays present themselves as ripe for nostalgia as Pentecost. After all, weren't these the glory days of the church – spirit-filled preaching; attentive, even miraculous listening; three thousand converted in a single day? Exactly. And what have most of us seen or done since that could possibly compare? The Majesty of the Holy Ghost is never separate from the Omnipotence of the Father and the Son, and whatever the Divine government accomplishes in the ordering of all things, proceeds from the Providence of the whole Trinity. Therein exists unity of mercy and loving-kindness, unity of judgment and justice: nor is there any division in action where there is no divergence of will. What, therefore, the Father enlightens, the Son enlightens, and the Holy Ghost enlightens: and while there is one Person of the Sent, another of the Sender, and another of the Promiser, both the Unity and the Trinity are at the same time revealed to us, so that the Essence which possesses equality and does not admit of solitariness is understood to belong to the same Substance but not the same Person. the Father sent him, his disciples are to go into the world to renew the face of the earth. With different gifts, they form one body. Performing different works, they are members of the body of Christ, the church. Wind and fire: ancient symbols of divine power and presence - The Breath of God, moving over the waters of chaos, producing the forms of life; breathing into lifeless clay, bringing forth a living soul; the breath of God in the Valley of Dry Bones, making those dry bones live. The fire of God: the refining and consuming fire of God's wrath and God's love. "A rushing mighty wind...and cloven tongues, like as of fire" - these are the mystical symbols of God's coming in power. John, chapters 14-16, is the high water mark in the Bible about the Holy Spirit. If you want to find out about the Holy Spirit, you can read the book of Acts, but an even better place to read about the Spirit is John 14-16. Why the Kneeling down and Sprinkling of water on the Feast of Pentecost in Syrian Orthodox Church? As it is very clear in the message of Christ, repentance is the only way to attain the Kingdom of God. Receiving the renewal of Holy Spirit is the sign and expression of becoming a member in the Kingdom of God. In Eastern Church kneeling down and crying Kurielaison is the most genuine and powerful expression of real repentance. There is no other way to invocate the Holy Spirit than our real repentance and confession. Your Christianity is to be visible. Your Christianity is to be seen, is to be noticed, is not to be hid. People are to know you are a Christian by what you say, by what you do, by who you are. If you are a Christian, you cannot hide it. It is the very nature of discipleship to be seen. There is no gift of God more excellent than this (love). It alone distinguishes the sons of the eternal kingdom and the sons of eternal perdition. Other gifts, too, are given by the Holy Spirit; but without love they profit nothing. Unless, therefore, the Holy Spirit is so far imparted to each, as to make him one who loves God and his neighbor, he is not removed from the left hand to the right. Nor is the Spirit specially called the Gift, unless on account of love. The Holy Spirit is the River, and the abundant River, which according to the Hebrews flowed from Jesus in the lands, as we have received it prophesied by the mouth of Isaiah. This is the great River which flows always and never fails. And not only a river, but also one of copious stream and overflowing greatness, as also David said: "The stream of the river makes glad the city of God." For neither is that city, the heavenly Jerusalem, watered by the channel of any earthly river, but that Holy Spirit, proceeding from the Fount of Life, by a short draught of Whom we are satiated, seems to flow more abundantly among those celestial Thrones, .., rushing in the full course of the seven virtues of the Spirit. The Holy Spirit appeared under the form of tongues of fire in order to fill the Apostles with truth and to prepare them to bear witness to Jesus. He also come to fill their hearts with love. He is the Person of Love in the life of God. He is also like a breath, an aspiration of infinite Love, from which we draw the breath of life. On the day of Pentecost the Divine Spirit communicated such an abundance of life to the whole Church that to symbolize it "there came a sound from heaven, as of a violent wind coming, and it filled the whole house where they (the Apostles) were sitting." It can be said that in the Holy Spirit the intimate life of the Triune God becomes totally gift, an exchange of mutual love between the divine Persons, and that through the Holy Spirit God exists in the mode of gift. It is the Holy Spirit who is the personal expression of this self-giving, of this being-love. He is Person-Love. He is Person-Gift. Here we have an inexhaustible treasure of the reality and an inexpressible deepening of the concept of person in God, which only divine Revelation makes known to us. We ought to pray to and invoke the Holy Spirit, for each one of us greatly needs His protection and His help. The more a man is deficient in wisdom, weak in strength, borne down with trouble, prone to sin, so ought he the more to fly to Him who is the never-ceasing fount of light, strength, consolation, and holiness. And chiefly that first requisite of man, the forgiveness of sins, must be sought for from Him: "It is the special character of the Holy Ghost that He is the Gift of the Father and the Son. Now the remission of all sins is given by the Holy Ghost as by the Gift of God. " The Holy Spirit "illuminates the human spirit and, by revealing Christ Crucified and Risen, indicates the way to become more like him,... to be 'the image and instrument of the love which flows from Christ'"... The images used by St. Luke to indicate the outpouring of the Holy Spirit — wind and fire — recall Sinai, where God revealed himself to the people of Israel and offered his covenant (cf. Ex 19:3ff.). The feast of Sinai, which Israel celebrated 50 days after the Passover, was the feast of the Covenant. The Holy Spirit gave the Apostles "the necessary light and strength to teach the nations and to proclaim Christ's Gospel to them all. In this way the Church was born and lives in the fruitful tension between the Upper Room and the world, between prayer and proclamation"...The witness of the Spirit is divine in itself: it comes from the depth of the Trinitarian mystery. The Apostles' witness is human: It transmits, in the light of revelation, their experience of life with Jesus. In laying the foundations of the Church, Christ attaches great importance to the human witness of the Apostles. Christian churches see Pentecost as the final fulfillment of the mission of Jesus. It is traditionally called the beginning of the Holy Apostolic Church. It reveals the identities of the divine trinity, namely, the Father, Son, and Holy Spirit...Pentecost is a great harvest of the Holy Spirit to empower and renew our life to be a witness for Christ. Our faith in God cannot live on man's wisdom alone. We need the experience of the Holy Spirit to sustain our faith and empower us to be the disciple of Christ. Taking all the four readings (prescribed for Pentecost) together, a theme is presented before the congregation by the Church. It can be put in one word, ‘relationship’; relationship between God the Father, the Son and the Holy Spirit and with life of humans in relationship. From the kind of relationship exists between the Holy Trinity, Jesus derives a model for the human relationship. This is a unique kind of methodology. We humans derive models for our life in this world from Godhead and the relationship that exists within Godhead. Christian faith in the Holy Trinity is not just a talk about some philosophical theory, rather it is the talk about a model, inspiration and guide for our lives in this world. The historical facts of this day, as well as the beautiful sermon the Holy Spirit delivered through the apostle Peter, which might appropriately be fully treated at this time, we shall leave for the special sermons on the various festivals of the year. For the present we will but briefly speak of the occasion of this festival, and of the office of the Holy Spirit. The Spirit proceeds from the Father and the Son. The exalted Son receives from the Father the promised Holy Spirit, and then he bestows the Spirit upon his church. That’s what happened at Pentecost, and it continues to this day. Jesus gives the Spirit to his church to empower her preaching of the gospel, bringing salvation to untold millions of people around the world, from the day of Pentecost up until this day, and till the day of Christ’s return. The Holy Trinity is doing something, actively rescuing sinners, giving us salvation, by bringing us the saving gospel. You yourself are among those recipients. By faith we receive the good news, in joy. By the Spirit’s working we believe in our Savior Jesus and so share in his victory. And by that same faith we now have and now a loving heavenly Father. It’s all good! On this day, the fiftieth after Easter, we celebrate the Feast of Pentecost when the fullness of the Holy Trinity was revealed through the coming of the Third Person of the Holy Trinity, the Holy Spirit... Today faithful Orthodox Christians, members of the Church, of all ages and all over the world and of all nationalities and languages, celebrate the Feast of Pentecost together. Today we concelebrate the Feast with the Apostles and the Fathers, the Martyrs and the Confessors, of all ages, of ages past and of the present age and of the age to come. For we confess the same Orthodox Faith of the Holy Spirit, 'Who proceeds from the Father and rests on the Son', for we confess the same Orthodox Faith of the Holy Spirit, Who brings Wisdom and Unity wherever there is humility and purity of heart. On the day of pentecost, the Holy Spirit descended upon each of them in the form of Wind, Fire and Tongues. That is, the Holy spirit is compared to these three symbols: Let us meditate on these 3 symbols. The Holy Spirit descended in the form of Wind or Air. The Holy Spirit descended upon them in the form of Fire. The Disciples received the Holy Spirit in the form of Tongue. Without the Grace of the Holy Spirit there is no salvation, no true Christianity. The gift of the Holy Spirit is imperative in the life of Christians. Every Holy Qurbana becomes a pentecost - through the descent of the Holy Spirit on the faithful and the gifts (bread & wine) transforming them into the body of Christ. The event of Pentecost is the link between Gospel and other part of the New Testament. It shows that the Church is the Church of Triune God; continuation of Creation, redemption in Christ and growing in Spirit. Why the liturgy of this Feast is like what a demonstration of the Holy Trinity, why there are three parts for the order of Service of the Feast of Pentecost? We worship the Triune God – The Father, the Son and the Holy Spirit. Each of our prayers starts and ends in the name of Triune God. No doubt, we believe in One True God - "The Father who by His grace created the world, the Son who by His precious suffering redeemed the world and the Holy and Living Spirit who fulfills and perfects all that has been and all that will be."